Booth Farm Cottage at Booth Farm in Buxton, Derbyshire sleeps 4 people. Booth Farm Cottage in Buxton is a semi-detached bungalow which lies in an idyllic location, surrounded by the spectacular countryside of the White Peak and close to the owner’s home, offering an ‘away from it all’ holiday retreat and is perfect for anyone who loves the great outdoors. There is an abundance of walking direct from the door, including to the sharp-edged limestone Chrome Hill and Parkhouse Hill, which as the remains of coral reefs are among the most remarkable sights of the area. 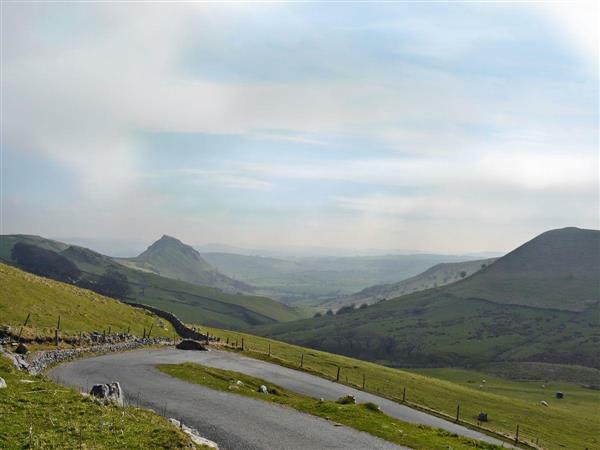 The location of Booth Farm Cottage is approached by a winding road through stunning limestone scenery and open moorland, and yet whilst rural, is just 5 miles from the Peak Park centre of Buxton. Longnor Village with its quaint cobbled market square and traditional pubs is just a 10 minute drive, and the ever popular villages of Hartington, Bakewell, Eyam and Castleton are all easily reachable in around half an hour, as are the magnificent historic houses of Chatsworth and Haddon Hall. Horse riding can be found nearby. The shop, pub and restaurant are 4¼ miles from Booth Farm in Buxton. Booth Farm Cottage can be booked together with Booth Farm Bungalow (ref 30854 [Booth Farm Bungalow]) to sleep up to 10 people. Ground Floor: Step to entrance. Booth Farm Cottage in Buxton is all on the ground floor. Living area: With wood burner, 42’’ Freeview TV, DVD player and Bluetooth speaker. Dining area: With double sofa bed (for flexible sleeping arrangements). Bedroom 1: With zip and link king-size bed (can be 2ft 6in twin beds on request). Oil underfloor central heating, electricity, bed linen, towels and Wi-Fi included. Travel cot and highchair available on request. Courtyard with patio and garden furniture. Bike store. Private parking for 2 cars. No smoking. Holidays at Booth Farm Cottage, Booth Farm run from Friday to Friday. Pets allowed at Booth Farm - Booth Farm Cottage. For a better idea of where Booth Farm - Booth Farm Cottage is, you can see Booth Farm - Booth Farm Cottage on the map below. Booth Farm - Booth Farm Cottage is in Derbyshire; should you be on the lookout for a special offer, you can find all the special offers in Derbyshire. It's always worth checking to see what is on offer at the moment. Do you want to holiday near Booth Farm - Booth Farm Cottage (UK4075), you can see other cottages within 25 miles of Booth Farm - Booth Farm Cottage; have a look to find your perfect holiday location.